FARMINGDALE — The crowd had been waiting. Ashtyn Abbott made it worth their while. 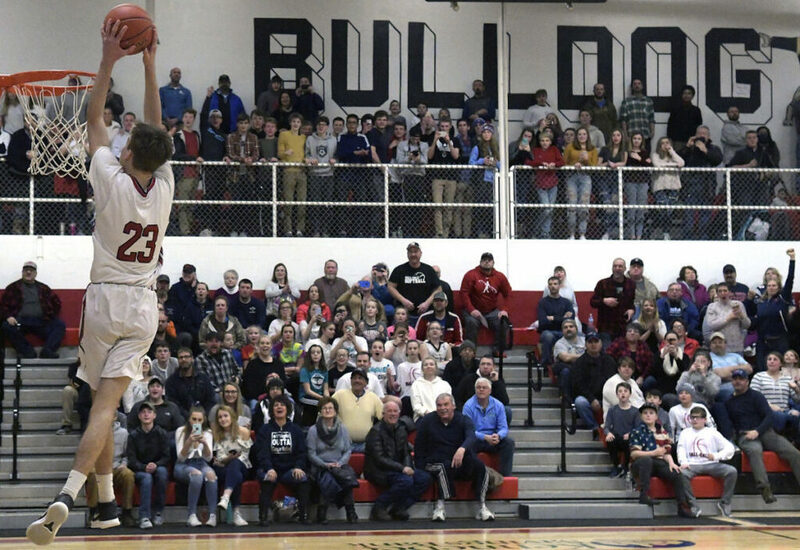 The Hall-Dale forward gathered a steal, ran down the court alone and threw down a dunk for the 1,000th point of his career late in the first quarter of the Bulldogs’ 73-47 victory over Dirigo at Penny Gym Thursday night. Abbott became the 12th Bulldog — the eighth Hall-Dale boys’ basketball player and the second in 10 days — to reach the milestone, after teammate Alec Byron scored his 1,000th against Boothbay on Jan. 21. Abbott needed only two points for the milestone coming in, and his team had a plan to get him the basket he needed right away. Instead, it was clear the Bulldogs weren’t going to force it in to the senior standout just to get the number out of the way. Abbott took only two shots in the first six minutes of play as Hall-Dale took an 8-6 lead, and the crowd noise rose and fell with each time he got, and then passed, the ball. With just under two minutes to go in the quarter, he got his chance. Abbott poked the ball loose from the Dirigo ball handler, and had no one in front of him as he dribbled toward the basket. Knowing what was coming, the crowd roared, and Abbott made the dunk for the 1,000th point with 1:54 to go in the quarter. Byron, who led the team with 23 points, was thrilled to have new company in the club. Even if it took a little longer than anticipated.